JACOPO SANSOVINO, born Jacopo Tatti, began his career as a sculptor and soon assumed the name of his mentor, the sculptor Andrea Sansovino [Andrea Contucci, c. 1467-1529]. Giorgio Vasari, the artist and early art historian of the period, attests that Sansovino was of average height, "not at all fat," with a pale complexion and a red beard. After establishing a successful artistic role in Rome, primarily as a sculptor, Sansovino left Rome for Venice in the aftermath of the Sack of Rome, 1527, expecting to return to Rome later to resume his uncompleted commissions there. 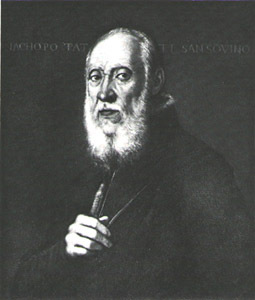 Sansovino was warmly received in Venice, Lorenzo Lotto referring to him upon his arrival as "second only to Michaelangelo." With the encouragement of Doge Andrea Gritti, Sansovino quickly became the most influential architect of Venice and his imprint is found throughout the city today. Despite invitations and commissions proffered by Francis I of France and Henry VIII of England, Sansovino after his arrival there left the Veneto only once, for a brief trip to Bologna. In 1529 Sansovino was appointed proto of the Procurators of San Marco, the most influential architectural office in the Republic. In that role he moved quickly to promote the reworking of the Piazza di San Marco into its present form. Construction of the new Zecca [Mint] to his design began in 1536, after tedious negotiations with the cheese-and-salami sellers guild who had occupied a portion of the site for hundreds of years. He also designed the Biblioteca [Library] Marciana opposite the Doge's Palace and the Loggetta begun at the base of the Campanile of the Basilica, construction of both beginning 1537. The Fabbriche Nuove di Rialto, begun 1554, was another of his public structures. While continuing his own sculpture output, he also supervised the production of others in his sculpture workshop and, at the same time, began to accept religious and private architectural commissions. For monastic clients he designed the Church of S. Francesco della Vigna (begun 1534) and completed the Church of Santo Spirito in Isola. Sansovino was also involved with three parish churches--S. Martino, S. Giuliano and S. Geminiano--and with the hospital church of the Incurabili. For charitable institutions, he created the Scuola Grande della Misericordia and the state hospital Ca' di Dio. For private clients, Sansovino's works include Palazzo Dolfin (begun 1538), Ca' Cornaro della Ca' Granda (begun 1545), Ca' Moro (perhaps) and, in the countryside of the Veneto, the fascinating Villa Garzoni at Pontecasale (c. 1537). The late portrait of Sansovino shown above is by his contemporary Tintoretto [Jacopo Robusti]. Vasari noted that Sansovino "enjoyed dressing elegantly and was very well-groomed; and he took pleasure in women right up to the end of his life . . ."